Bartoli had just won Wimbledon on Saturday, beating Serena-killer Sabine Lisicki 6-1, 6-4. And this is when a tennis player’s emotions are at their most obvious and overwhelming. They’re in your throat. Know this: Bartoli has fired her dad, her coach, twice this year alone. And now, her first act as champ is to be with him? How did you feel about this match? No Venus or Serena Williams and no Maria Sharapova? The hard truth for tennis is this: That was a terrible match for the sport. Terrible. For most of the match, Lisicki was in complete panic. The learning curve is painful and cruel, and you can’t avoid it. It’s as if you’re driving down the road and your car automatically searches out and finds every last bump and pothole, even cliff. For Sloane Stephens, American tennis hopeful, the problem is that you don’t know for sure which bumps you’ll eventually figure out how to clear easily and which ones you never will. Which ones will you learn from and which ones will define you. 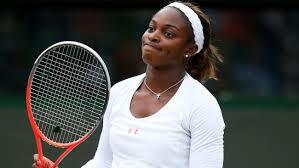 Stephens ran off the cliff Tuesday at Wimbledon. She was playing brilliantly and beautifully, and then she was duped for the second time in three majors by someone pulling a veteran’s dirty trick on her. She lost 6-4, 7-5 to Marion Bartoli in the quarterfinals. If you thought this tournament was a torch-passing from Serena Williams to Stephens, then take a deep breath and sit down for a minute.